he left me for a few hours. And what happened was the chord sequence for 'Storms in Africa'. So I worked very closely with him on the theme, because, once he had heard the initial sort of, chord sequence with this sound, he came up with the title 'Storms in Africa', and so we took it. He kind of, in a way, guided, the direction, the arrangement, to that song. And it was nice - it was a different approach yet again. Hello, this is One To One, and with me today is someone whose first single, 'Orinoco Flow', went to number one in the charts. And the album that it was taken from, Watermark, has sold in excess of four million copies. Enya, welcome. Gary Davies: It must have "blown your mind" when your first ever single goes to number one. Enya: Yes, yes it did. Um.. I had no idea on working on Watermark.. first of all, how the music... how people would react to the music. It's very different, and so is 'Orinoco Flow'. And to, ah, get the song to go to number one, ah, meant that Watermark would also, ah, get a chance to be listened to and it was wonderful. Gary Davies: When you were writing 'Orinoco Flow', did you feel that that song was special? [she laughs] Did you know that it might stand a chance of being a hit? Enya: No, it was the last song that I worked on, and it was, um, shelved quite a few times. But every time myself and the producer, Nicky Ryan, listened to it, we knew, this is exciting, you know, and we'd work on it for another few months, and then decide, no no no, lets concentrate on the rest of the album and so it was shelved again. But it was, um, when we were finishing the album, we felt we were one short and decided, well, we'll just have to work on 'Orinoco', and hence, we had no idea that it would be a single. Gary Davies: Because, really, 'Orinoco Flow' is quite different to the rest of the music that was on Watermark. Is that why you kept shelving it? Enya: Well there's a lot of tracks on Watermark that are very different to each other, and that's the way, um, I think, myself and the producer like to work. 'Cursum Perficio' is very, um, choral, and then 'Watermark' is an instrumental on a piano. And then, there's a song in Gaelic. So a lot of the songs on the album are very different to each other. So that's why we actually knew 'Orinoco' would sit with the album. But it was just a matter of being happy with it. That's what took us so long. Gary Davies: When you were making the album, were you envisioning singles were going to be taken from it - or did you just imagine people would buy the album... as a whole? Enya: Uh half laughs, I just, um, I had no idea, when I finished the album. And I wanted that it would be listened to. And I remember thinking, if one person approaches me afterwards and says, um, "I love the album", I would have been content with that. So, you can imagine, I was completely thrilled with the reaction. Gary Davies: How long did it take you to, from start to finish, with Watermark? Enya: Watermark was about 12 months, working on it..
Enya: Yes, it would've been but again, ah, it was like a different project for each song. And we'd take it to a certain stage and then leave it aside. When you've finished an album, you cannot tell, um, if you're happy with the end result, and it's only, maybe, a few months later... I had done that with the latest album, Shepherd Moons. I purposely would not listen to it for two months. And then afterwards, I've decided, right, it's time to listen to it. It's because of performing all the music, singing all the vocals, the way I work, it's very intense. And if you're working with something this close [holds hand up to face], it's very difficult to know what it is, what the end result sounds like. But, um, if you have the distance you can then tell. So, ah, I always have to have time in between, and that's why it takes so long to get an Enya album, ah, finished. I compose the melodies, and then, um, Nicky Ryan, the producer... I will play the ideas to him, and then, ah, the lyricist, Roma Ryan, gets involved... at different stages of the song. Sometimes the lyrics will happen on the first time of listening to a melody, but then sometimes she might wait till it's arranged. But, um, it's between the three of us working in the studio. Gary Davies: Do the lyrics tell a story? Enya: Oh yes, they do. Because, um, to perform them, you have to know what you're singing about. So if it's in Latin, Gaelic... well Gaelic is my first language, so I know what I'm singing. But, um, it has to go deep for me to perform. Gary Davies: If you're singing in Gaelic, or you're singing in Latin, are you not concerned that people, who maybe buy the records, won't know what you're singing about? Enya: Again, it... it goes back to enhancing this melody, where, ah, we don't really concern ourselves with, ah, how people are going to react in the end. The main concern for us is that we are happy with what's happening in the studio. And then in the end, well, we will worry about that [she laughs], we think.. "why have we sung in Latin?" - it felt good at the time, so we did it, you know. Gary Davies: Do songs evolve, and melodies evolve, from the fact that you travel a lot or... Do you find that travelling helps you write? Enya: Um, it would influence me... in some ways... ah, I could feel, for Shepherd Moons, ah, influences from around the world... from Japan, from Spain. But um, again, when I'm composing, I don't like to dictate whether it's a song, it's an instrumental, it's in Gaelic... I'd rather listen to it and just see what it wants, what it, um, it needs. Gary Davies: So you literally just sit yourself at a piano and play away, and see what comes out? Gary Davies: chuckles Any time of day or night, or do you have a strict regime where you say "OK, from nine to five, I'm going to be in the studio composing?" Enya: I have to discipline myself. I'm not one of these people, walking along a beautiful beach, and the melody, um, will occur. It doesn't happen that way. I'm sure it does influence me.. but, um, I have to sit there, at the piano, and decide to work on certain hours. And I record, um, all the ideas, and then eventually, at the end of the week or at the end of the day, I'll listen back to see if there's anything there. Gary Davies: Where do you go to get the studio out of your brain - when you need to escape.. when you need to forget everything? Enya: I might, ah, go to Donegal to see my parents. Um, it's very beautiful there. Go for walks.. try to unwind. And, um, generally, um, meet with friends and family. Because when I'm in the studio, it's very difficult to.. for me to leave the studio. In the studio, um, it's very emotional.. it's very draining all the time to have to, um, think "er.. how's this going to sound". Like, in a lot of cases, singing 200, 300 vocals and listening to it and saying "it's very nice, but it's.. it's not right". So we just erase it out.. very quickly.. Or it might be a case of listening to the vocals after two days of recording, and saying "this is going to work, but the sound is wrong". So we get Roma involved then. But, um, it takes a lot of work to find that end result. Gary Davies: Do you wish you could do it quicker? Enya: No. Because there's a lot of stories that go with each song. And when I listen back to them now, Watermark, or Shepherd Moons, um, I can hear the history of that song - how it started, all the.. the arguments, the fights, the achievements. You know, that wonderful feeling of knowing 'well this is exactly how I hoped it would sound like'. Gary Davies: And 'Storms in Africa', was that because, when Roma heard it, she felt it sounded like storms in Africa? Enya: The title actually came from Nicky for this one. It's, um, it was an instrument, um, the Juno 60, and it's got this arpeggiator, and he had set it, and he had said to me "I'd love you to write the melody with this 'sound', and the arpeggiator", and..
Gary Davies: That's the synthesizer? Enya: Mm hmm.. and, ah, he left me for a few hours. And what happened was the chord sequence for 'Storms in Africa'. So I worked very closely with him on the theme, because, ah, once he had heard the initial sort of, ah, chord sequence with this sound, um, he came up with the title 'Storms in Africa', and so we took it. He kind of, in a way, guided, um, the direction, the arrangement, to that song. And it was nice - it was a different approach yet again. There's always been music in my family. Um, both my parents are musical. My mother's a music teacher. My father was an entertainer.. and still is. And, um, there were these 'feisanna cheoil', which is a singing competition. And my mother used to enter me into the singing competition, so I can recall being very young, um, singing two songs - they would have been in Gaelic. Enya: Five.. six. And, I enjoyed this and then, um, I was studying piano at a very young age as well. But because of, um, some reason or another, I couldn't attend the school to continue my piano lessons, so I then self taught myself.. till, um, I went to boarding school and then I could study music, and carry on with.. with my piano studies. Gary Davies: Which was the first musical group that you were with? Enya: It was my brothers and sisters..
Enya: Mm hmm.. and, ah..
Gary Davies: Were you forced to join? Enya: No, I was actually asked by Nicky Ryan, who was doing sound.. live sound.. with them, and they needed a keyboard player, and I was approached, and at that time I was studying with a professor of music, but, ah, I thought I would see what it was like, and the music was Irish traditional music at that time, and I was with them for a few years, but felt, because of my classical studies, there was something else that I wanted to do. And, ah, having met Nicky.. and Roma as well.. um, he had a lot of musical ideas, and one of them being the multi-vocal, um, recording. So, um, it was a case of deciding 'let's see what happens'. Gary Davies: If we can talk about The Frog Prince, because.. was that your first solo project? Enya: It.. it was. Um, it was, ah, based on the first six melodies I had ever written. And they were all instrumental. And it was Roma, ah, who had suggested that, um, it would be suitable for film. And had approached a few film directors.. a few film producers. And, um, she got to meet with David Puttnam, and he said that he loved the melodies, and wanted to work with us and hence, The Frog Prince. And it was so strange, you know, um, to come from the studio, on your own, writing melodies, to be involved with.. with something I love, and that's the film world. Gary Davies: Your music's been used in Green Card, and you had a song in L.A. Story with Steve Martin. Are you a Steve Martin fan? Enya: Yes. Yes I am. Gary Davies: Which is your favourite film? Enya: Um. Well let me see.. I think All Of Me, was, ah, a wonderful film to see. He's.. he's really wonderful. And, um, again it was so strange that these two films were comedies. But the scenes that they had chosen to play the music, was quite emotional. Like Exile, in that scene, it was very emotional, and again, when I saw this, I knew it would work. Gary Davies: As well as films, your music's also been used in TV commercials. For example, Orinoco Flow sold paint.. Book Of Days is selling cars. Are you not bothered by that? 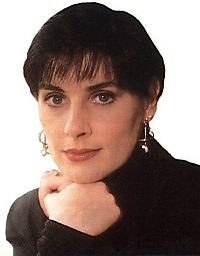 Enya: Again, um, we had seen the advertisement, and, we are inundated by advertisements, and again we feel we cannot turn down each one of them because of, they're gonna go away and make a copy of what we sound like.. and we concentrate on the visual, and how the music sits with it. And if they do work together, then that's fine, because, um, there are a lot of people who still don't know who Enya is. So, in a way, we use it. We think about that side of it as well. Gary Davies: Shepherd Moons.. Why "Shepherd Moons" as a title for that? Enya: It comes from the title track, and it's an instrumental. And I played it to Roma, and she said "Shepherd Moons". And the story behind it is, ah, around Saturn, ah, there are all these rings, which protect Saturn, and the rings are kept there by two little moons, and they're called 'shepherd moons'. And, um, I thought it was very appropriate to the melody. But I liked the idea of they're protecting, and then, ah, the romantic side of the moon as well. So when it came to the title of the album, we waited till we'd finished all the songs and the titles were there. And we felt Shepherd Moons was the one we had a preference for. Gary Davies: The video to 'Caribbean Blue' is magnificent.. I mean.. it must've taken longer than making the album! Enya: It was two days. Um, they had built three beautiful sets, and a lot of the work is, ah, the animation afterwards. Gary Davies: Who did that? Enya: It was, um, Michael Geoghegan, who has directed all my videos. And it's.. it's really good to meet somebody who understands the music and also understands me - how I want to be portrayed, and it.. it's a nice feeling. I'm very comfortable when I'm filming a video. Gary Davies: The animation must've taken a lot longer than two or three days! Enya: It did laughs. It.. it, um, I think there was ten artists, um, painting non-stop for three weeks. And, it does take a long time, but the effect is.. is perfect. Gary Davies: What was the idea of having the kids in the video? Enya: Well the idea, um, came, ah, from the Maxfield Parrish, ah, paintings. And, ah, there was a few of his illustrations that were shown to me, and there was a little boy climbing in to this beautiful fantasy world, and he was taken through. And it was decided I would take him through this beautiful, um, Caribbean paradise. Gary Davies: Do you think you'll ever go out on the road - will you ever tour? Or is your music gonna to be too difficult to recreate in a live situation? Enya: It's something that, um, we talk about, but, because of Shepherd Moons took so long, and then I travelled around the world for about four months promoting the album, and the priority at the end of this year would be.. do we want to talk about getting the music on the stage, or do we want to start on the next album? And at this stage, I'm quite anxious to get back to the studio. Gary Davies: Now 'Book of Days', on the album, is an instrumental piece of music. At what stage were words added, and at what stage did you extend the song? Enya: Well there is a strong theme of 'book of days', because, um, I have a book of days, um, a diary. And I've always kept one. And it was Roma's suggestion again. Ah, she likes to be able to associate with me, because I'm the one who's going to sing. And, um, there is some Gaelic in it.. in the instrumental version.. and it talks about, um, the beginning of the day, and the excitement, the expectations, one has. And it's, ah, the eagerness of what is to become of this day. And when, um, Ron Howard approached us, for the film Far and Away, it was similar in a way because there were these two people, and we watch, um, their 'book of days', their diary, of how they met up and how they went across to America. And so, um, it was quite easy to interpret the lyrics with the song, because it was still associated with the theme that was originally there. Note: Paul Lebeau. Posted 2 August 1993 .